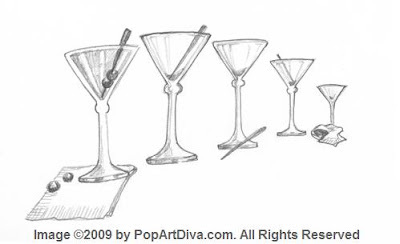 Contrary to what most of us were taught, having a cocktail or two a day is not necessarily a bad thing. Drinking alcohol picked up a bad rep somewhere in our past history and with that reputation it picked up an association with being unhealthy as well. While drinking in excess is obviously a bad idea for your health and your over all well being, drinking in moderation is now being linked to having health benefits! As The Martini Diva I celebrate the art of the drink, the enjoyment of a well mixed cocktail and the shared, communal ritual of happy hour, but I never promote or encourage excessive consumption, drunkenness, binge drinking or simply drinking to get drunk because this goes against my philosophy of "happy" hour! To me the whole point of my slogan "where martinis are a lifestyle" is to enjoy the conviviality of friends with good food and good libations, and to enrich life with some style and flair. Slamming down drink after drink in order to get buzzed defeats the whole concept of elegance and grace that is at the core of why I enjoy martinis! One or two cocktails with friends at the end of a long, stressful day is a perfectly healthy way to decompress and a great addition to a charming life - especially if you use healthy ingredients! Buy a juicer and use FRESH fruits and vegetables instead of canned or frozen juices or sugar loaded commercial cocktail mixes or pop. Load up your cocktail pick with some pieces of those same fresh fruits and veggies as your garnish. Replace creams and milk with non-fat yogurt or pasteurized egg whites. Use honey, blue agave nectar, or molasses instead of simple syrup. Use Blue Agave sweeteners or Stevia in place of processed white sugars. Even raw sugar is better than processed white sugar. Use sea salts in place of table salt. Use low or no salt added ingredients like Worcestershire, hot sauces or sparkling sodas.